Did you know that diabetes can harm your eyes? Well it can! It can damage the small blood vessels in your retina, also called retinopathy. Diabetes also increases your risk of having glaucoma, cataracts and other eye problems. To make matters worse, because many of these eye problems develop slowly you may not have noticed the damage that diabetes is causing until the problem is really bad. Getting your regular eye exams is crucial to treating the problem successfully. Here at Druger Eye Care, we take diabetic eye care very seriously. We treat patients all around the Syracuse & Auburn NY areas. To learn more about diabetic eye care, contact us by calling (315) 488-1601. We recommend getting an eye exam every 2 years if you are under the age of 30, and annually for all those with vision problems or if you over 50 years old. Early detection can lead to better treatment results, especially with eye problems like glaucoma where the vision loss can be irreversible. • Dilating your eyes to allow us a good view of your retina. 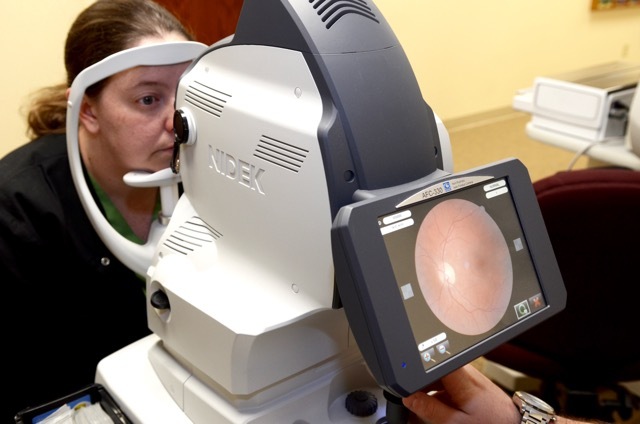 This will allow us to look for signs of glaucoma or cataracts. • A comprehensive vision exam and medical history to see how your vision is progressing as you get older. Simple Diabetic Eye Care That Prevents Eye Problems? Control you blood sugar levels – High blood sugars increase your risk of having eye problems. Control your blood pressure – Blood pressure less than 130/80 is a good goal for a person with diabetes. You should check your blood pressure at least twice a year. Exercises – if you are already experiencing vision problems, some exercises may make put unnecessary stress on your eyes such as weight lifting or high-impact athletics like football or hockey. Talk to your doctor if you are experiencing any diminishing effects as you could make the problem worse.